Nowadays, consumers around the world are taking long overdue and much needed steps to reduce their individual impact on the environment. One of the biggest culprits when it comes to pollution is the automobile. A large part of each day is spent stuck in traffic, especially in Los Angeles, meaning that fuel emissions steadily work their way into the atmosphere and have a large and lasting impact on our lives. Making the switch to a hybrid vehicle at your Los Angeles Toyota dealer not only reduces your environmental footprint, it can also save you money in the long run. Learning about the benefits of hybrid vehicles and Toyota’s hybrid options will help you make the best decision for you and your family when searching for your next car. When you think about all of the time you spend in the car, it is easy to see just how harmful millions of cars on the road are for the environment. There are three immediate environmental benefits to driving a hybrid vehicle that have both short-term and long-term effects on you and the world around you. Lower Fuel Demand– With more and more hybrid cars now on the road, the collective demand for gasoline and other fuel is going down. Eventually, this can lead to a reduced need for these fuel sources and less drilling for oil around the world. Better Gas Mileage – According to Living Green Magazine, a hybrid car gets five miles per gallon better mileage on average than a traditional gasoline-powered vehicle. In addition to the better mileage, hybrid cars do not need to be filled up with gasoline as frequently, due to the alternative energy source used. Reduced Emissions– While it is a byproduct of the previous two, a major benefit of hybrid vehicles is that they give off fewer emissions. Much less carbon monoxide is released into the atmosphere, since less gas is being used, meaning hybrids help reduce air pollution. In addition to helping the environment, driving a hybrid vehicle also allows you to take advantage of financial benefits that are well worth the initial investment. Although they cost more when you are first buying, hybrid cars can help you right where you feel it most: the wallet. J.D. Power notes that a hybrid version of a vehicle typically runs about $5,000 more at the start than its gasoline-powered equivalent. This is the case because you are paying more for the electric motor and battery. However, it is important to compare the initial price of the car to the amount of money you’d save each year on gasoline. When you multiply that by the amount of years you plan on driving the hybrid, it is easy to see that the car will end up saving you money down the road. This is especially true when you factor in the reduced frequency of trips to the gas station, as well as the overall better gas mileage you get with a hybrid. Although they require special equipment and expertise for servicing, the rise in popularity of these vehicles is sure to result in making it easier for drivers to buy and maintain hybrids. As you look for a new or used hybrid vehicle to purchase, you want to make sure that you buy from an established Los Angeles Toyota dealer. You may think that opting to go hybrid limits your choice in vehicles and keeps you from getting the car you want, but that isn’t the case. Finding the perfect hybrid car has never been easier, and Toyota offers affordable vehicles that are also at the top when it comes to consumer and expert reviews. The 2015 Prius C, for example, is the smallest car in Toyota’s hybrid line, but it is also one of the most efficient cars on the road today. 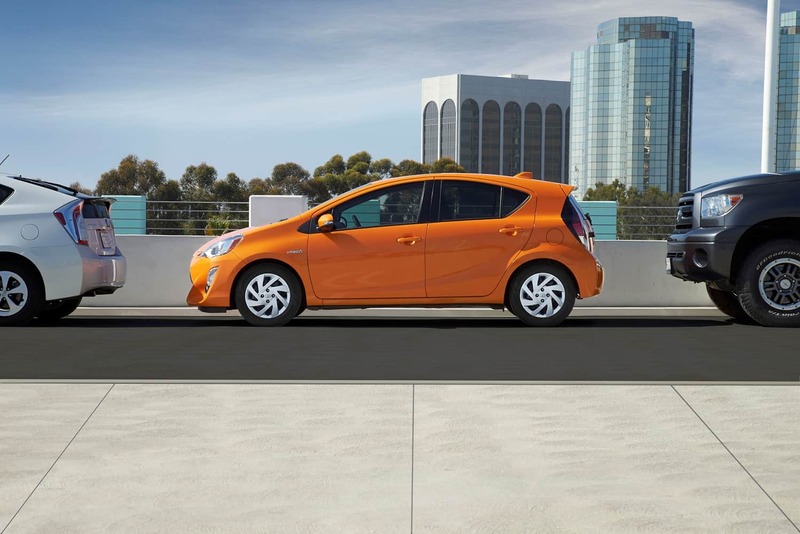 Prius C gets a best-in-class highway fuel economy of 53 miles per gallon. The car has a 73-horsepower, 4-cylinder 1.5-liter engine, as well. A new Prius C starts at just over $20,000, and a top-of-the-line version can be had for around $25,000. The 2015 Prius V is a step up from the Prius C, and it has a 98-horsepower, 4-cylinder 1.8-liter engine. The car gets 44 city and 40 highway miles per gallon, while also boasting the cargo capacity of a small SUV. This four-door model has room for your family and everything you need to haul. It can be yours for under $30,000, as well, which is a steal when you think about its longevity and lowered need for gasoline. The 2015 Toyota Camry Hybrid is another entry for Toyota on Kelley Blue Book’s list of the 10 Best Hybrid Cars Under $30,000. Built with the same reliable hybrid engine as a year ago, the 2015 Camry Hybrid gives drivers even more value this year. It is restyled on the outside, has a newly designed interior, and more attention has been put into the experience of the driver and passengers. With more equipment now standard, you get more for your money. The original Prius is back for 2015 and, once again, shows what has made it the best-selling hybrid of all time. The Prius is practical, reliable, and efficient, giving you the mpg you expect from a hybrid, with the drivability as good as any around. With an EPA estimated 51 city and 48 highway mpg, it isn’t hard to see why. The best way to go about buying a new or used hybrid is to visit your local Los Angeles Toyota dealer. Take a look at inventory online and research the various options you want—that way you know exactly what you want when you head to the dealership. Then, set up a time to meet with a sales representative to go over your options and get all of your questions about hybrid technology answered. Get in contact with a representative from North Hollywood Toyota to learn more about Toyota hybrid cars and set up a test drive today. Living Green, “How Hybrid Cars Help the Environment,” Living Green Magazine, 28 August 2013, Web, 16 April 2015. “The Advantages of Hybrid Cars,” J.D. Power, n.p., 10 August 2012, Web, 16 April 2015. “10 Best Hybrid Cars Under $30,000,” Kelley Blue Book, n.p., 27 March 2015, Web, 16 April 2015.